Mostly clear, with a low around 45. West southwest wind 6 to 11 mph becoming south in the evening. Sunny, with a high near 82. South southwest wind 10 to 13 mph. Mostly clear, with a low around 51. South wind 10 to 13 mph, with gusts as high as 18 mph. Here is the link to the 2019-2020 Campus Ministry Application Form. Applications are due on May 1st! As you may already be aware, the Schwan’s Cares fundraising program will end on April 30, 2019. If you have purchased or received an eGift card through a Schwan's Cares campaign and have a balance on that card, you'll want to record and store the Card Number and PIN prior to April 30, 2019. While your Schwans eGift card never expires, you will not be able to access to it from schwans-cares.com after April 30. Step 1. Click here to access your eGift Card. Step 2. Copy and safely store your Gift Card Number and PIN for future use. Our Trojan Jazz Band and Swing Choir are taking their talents to the Northeast Jazz Festival on Monday March 25 at Northeast Community College! There is no better way to cheer them on then packing the house with Trojan fans! Our library catalog is now online! 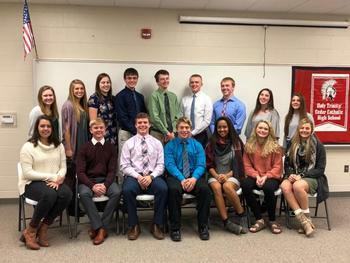 On Tuesday evening, November 13, 2018, Cedar Catholic inducted 16 new members into the Cedar Catholic Chapter of National Honor Society. To qualify for the Cedar Catholic Chapter, students must have a cumulative GPA of 93.0%. Not only are academics important, but leadership, character and service are also critical. Once scholarship has been met, students are asked to complete an information sheet listing leadership roles, service work and honors received. Students also write an essay to explain how their service has impacted their leadership and character. Three letters of recommendation are required of each student to aid in the area of character. Again, this recognition is a highly coveted honor. Congratulations again to all who were selected. This is a great honor. The seniors are: Jada Cattau, Derek Heimes, Jaron Kleinschmit, Joshua Pinkelman and Gabrielle Steffen. The juniors are: Tori Arens, Ted Bengston, Jayda Bernecker, Maizie Christensen, Jacob Keiser, Hannah Kleinschmit, Rebekah Kleinschmit, Matthew Rokusek, Ann Steffen, Wyatt Wiebelhaus and Aiden Wortmann.